On the 13th of April, 1743, in a farmhouse among the mountains of Central Virginia, a male child was born who was destined to stamp his genius and personality upon the future nation. The father was a backwoods surveyor of Welsh origin, and a giant in stature and strength. His name was Peter Jefferson, and he called his boy Thomas. Peter Jefferson was the owner of thirty slaves and of a wheat and tobacco farm of nearly 2,000 acres. He was a stern man, though kind and just. One of his favorite sayings was, “Never ask another to do for you what you can do yourself.” He died when Thomas was but 14 years-old, and was ever remembered by his son with pride and veneration. From the very first, young Thomas was an especially bright child. He inherited his mother’s gentle, thoughtful disposition and her love for music and nature. He also took naturally to books and studious pursuits. He might have been over studious, but his love of nature made him a keen hunter, a fine horseman, and as fond as George Washington of outdoor sports. There were ten children in the Jefferson home. Young Thomas was the third. He had a great affection for his elder sister, Jane. The two were always together and she did much toward elevating and ennobling his character. Her early death, at the age of just 25, was regretted by Jefferson to the end of his long life. 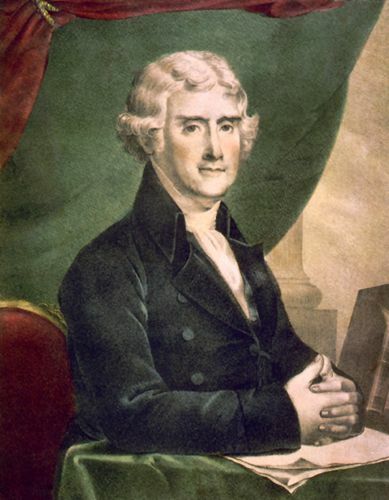 Young Jefferson entered William and Mary College when he was seventeen. He was described as one of the “gawkiest” students of the session, but professors and students alike soon found out his worth. Dr. Small, a Scottish professor of mathematics, was particularly attracted to him, and exercised a great and beneficial influence over his character. Among Jefferson’s early companions was a jovial young fellow noted for “mimicry, practical jokes, fiddling, and dancing.” His name, like Jefferson’s, has since been written indelibly upon the country’s history. Every school boy and girl knows it. It was Patrick Henry. The two were boon companions in their youthful sports. Shortly after Jefferson entered college, Patrick Henry strolled into his room one day, and delighted him with the news that he had been studying law since they parted and that he had come to Williamsburg to get a license to practice. Jefferson questioned him eagerly. When he found that the young man had, in reality, studied law only about six weeks, he was doubtful of the outcome; but, needless to say, young Henry secured his license. Some time afterward, when Jefferson was himself a law student and young Henry was a member of the House of Burgesses, which met at Williamsburg, matters between the King and the colonies were brought to a straitened pass by the issue of the Stamp Act. Young Jefferson never forgot the scene. He listened enthusiastically to the heated debate which followed. 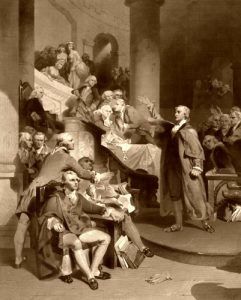 The “torrents of sublime eloquence” which fell from the lips of Patrick Henry almost took his breath away, and a well-spring of patriotism bubbled into being in his strong young heart. He resolved that he, too, would strive to serve his country, and to this end redoubled his studious efforts, sometimes spending fifteen hours a day over his books. The result was that he soon became the most accomplished scholar in America. He excelled in mathematics and was acquainted with five languages beside his own. 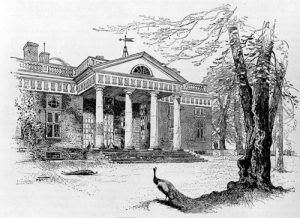 He celebrated the occasion of his coming of age by planting a beautiful avenue of trees near his house, which he had built upon a high hill and given the name of “Monticello,” meaning “little mountain.” He delighted in trying new things and imported a large number of trees and shrubs to beautify his grounds, which were marvelous indeed. When George Washington was elected commander-in chief, Jefferson took the place which he vacated in Congress. He was at once recognized as an influential member. No one was better than he on committees. He was so prompt, frank, and decisive. Again, no one had a clearer insight of a situation or understood his countrymen better. He was sagacious, wise, and prudent; by birth an aristocrat, but, by nature, a democrat. He cared very little for pomp and ceremony, and despised titles and the insignia of rank. He could not make a brilliant speech, but in his hand the pen waxed mighty indeed.